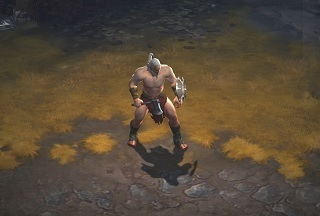 Diablo III offers up to three unique game modes, giving you plenty of options for demon slaying and treasure hunting. Note: The Adventure and Challenge Rift modes require the Reaper of Souls™ expansion (PC) or the Ultimate Evil Edition (PlayStation®4 and Xbox One) to play. The Campaign is the default game mode, and is recommended for new players. In this mode, you will experience the epic story of Diablo III, and explore the world of Sanctuary through four acts, from the eerie town of New Tristram to the Gates of Heaven, battling terrifying demons and collecting rewards along the way. The Reaper of Souls expansion adds another act to the campaign: travel the sprawling streets of Westmarch as you race against time to stop death itself from consuming Sanctuary. The option to create games in Adventure Mode becomes available as soon as you defeat the boss of the final act in Campaign Mode. This mode allows you to create a game with all acts and waypoints unlocked as well as quests and story events disabled. 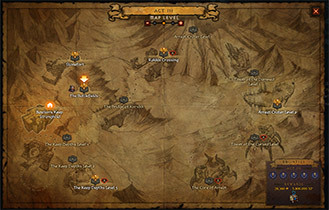 Adventure Mode games provide new objectives not found in campaign mode, such as Bounties and Nephalem Rifts. To begin a game in Adventure Mode, open “GAME SETTINGS” from the main menu and select “ADVENTURE”, then “START GAME”. Once you’re in an Adventure Mode game, you can use the “M” key (PC) or down on the D-Pad (Consoles) to bring up the world map and select which act and waypoint you’d like to explore. 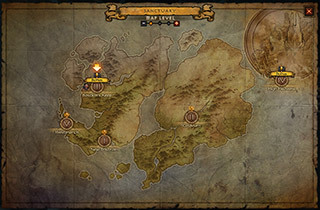 While in Adventure Mode, you can freely travel to any region in Sanctuary without having to create a new game. While playing in Adventure Mode, you’ll be able to hunt for Bounties. Bounties are special missions to kill a specific enemy, clear an area, or complete an event. Successful bounties award gold and treasure, of course, but also crystalline blood shards – items which can be traded to the merchant Kadala in town for Horadric treasures and mysterious, apocryphal artifacts. To see the available bounties in each act, press the “M” key (PC) to bring up the world map. Waypoints with nearby bounty objectives will be marked with a “!”, and clicking on one of them will teleport you there. Whenever you enter Adventure Mode, one random act will offer an extra cache of rewards—this act will be marked with a “BONUS” tag on the world map. Completing a Bonus act will move the bonus effect to another act. Completing all of the bounties in an act will reward you with a loot-filled Horadric Cache, which can contain one exclusive legendary item from that act (up to two in higher Torment difficulties), crafting materials, and other riches. Certain items, including crafting reagents used for Kanai's Cube, can only be obtained in this manner. Horadric Caches from Act IV offer a random reward from the other acts. Horadric Caches obtained in Act IV offer a random reward from the other acts. Nephalem Rifts are alternate realities made up of randomly generated terrain containing unpredictable combinations of foes. Inside Rifts you may encounter Pylons, which boost your abilities in rule-shattering ways. Defeating enough monsters inside a Nephalem Rift will summon a random Rift Guardian—a powerful foe with terrifying abilities...and magnificent treasure. 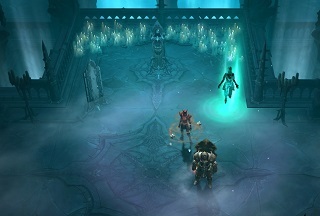 Rifts can be accessed in Adventure Mode games–simply click on a Nephalem Obelisk (located in any town). This will open up an interface where you can select between opening a Nephalem Rift or a Greater Rift. While you can open an unlimited amount of Nephalem Rifts, Greater Rifts require a Greater Rift Key (obtained by killing a Nephalem Rift Guardian). Greater Rifts have many difficulty levels— each one progressively harder. To reach the next level, you’ll have to summon and kill the Rift Guardian within a limited time. Until the Rift Guardian is defeated, you cannot change your skills or equipment. If you run out of time, you’ll still be able to complete your current level, but won’t unlock a new difficulty level or have the chance to upgrade your legendary gems. Your highest Greater Rift difficulty level completed and best time will be posted to the Rankings page. Except for the Rift Guardian, monsters in Greater Rifts don’t drop loot, so you can focus on killing as fast as possible. Rift Guardians in Greater Rifts may drop Legendary Gems. 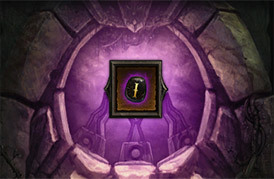 Unless you've already contributed a Greater Rift Key towards opening a Greater Rift in a multiplayer game, you won't be able to teleport to players within that Rift. If you complete the current level with an exceptionally fast time, you might unlock more than one difficulty level. The ancient nephalem spirit known as Urshi will be summoned if you manage to defeat a Greater Rift Guardian within the allotted time. She will allow you to upgrade your Legendary Gems. You can earn additional attempts to upgrade your Legendary Gems by clearing higher tier Greater Rifts. You can also use the Nephalem Obelisk to pay gold and open an Empowered Greater Rift, which will grant you an additional attempt at upgrading a gem upon completion. Urshi's Legendary Gem-upgrading enchantments won't always succeed, so you'll want to conquer more Greater Rifts in order to summon her again. If you come across a Legendary Gem and select it, you'll notice it has a rank value below its name. Each time you meet Urshi by completing a Greater Rift within the time limit, you'll have the chance to upgrade the rank of your Legendary Gems. Increasing the rank of Legendary Gems unlocks additional properties that take effect when they are socketed into jewelery. While exploring Leoric's Manor in Adventure Mode, you may come across long-forgotten signs of hidden dungeons that will test your aptitude with the game’s class-specific sets. Each clue, if followed while wearing the corresponding set, will lead you to hidden dungeons with special rewards. A banner sigil can be won from completing a set dungeon. Basic Completion of all set dungeons in a class will reward you with a class pennant, while a special pennant is awarded for Mastery of every dungeon in a class. Even more rewards await if you're able to complete all set dungeons in the game with Basic or Mastery completion! When you start a game in Challenge Rift Mode, you inhabit the form of another Nephalem. To defeat this challenge, you must face the same perils and circumstances they did, and prevail. Starting a game in Challenge Rift mode will bring you to the Challenge Hub, where you can use the Soul Mirror to check the active and passive skills, Kanai’s cube powers and the equipment of the warrior you are embodying. You can also test your newfound skills against ghostly enemies who won’t fight back, so take some time to try out your abilities and ensure you’re ready. To begin the challenge, click the Challenge Obelisk at the center of the Hub. You’ll then have a set amount of time to beat a Greater Rift of a predetermined difficulty. Monster placements and the map layout are fixed—the true test lies in how will you use the skills at your disposal to finish it faster than the Nephalem who preceded you. If you are successful, you’ll receive a Challenge Rift Cache, which contains a myriad of useful items from crafting materials and gems to Blood Shards and Legendary items. Should you beat the challenge fast enough, you’ll earn a spot on the Leaderboards as well.